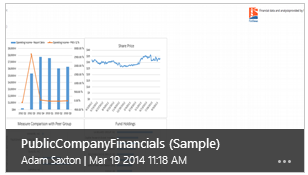 We’ve had some questions regarding the thumbnail images within the Power BI Sites about what the different images mean. I wanted to go through these to provide some understanding, along with how you can control some of the behavior. We’ll start with a workbook not being enabled for Power BI. 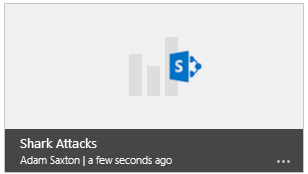 This can happen if you add the workbook through your normal SharePoint Site, instead of via the Power BI Sites. 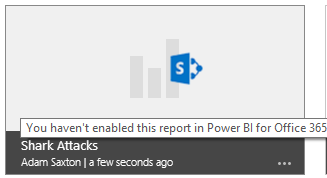 This means it was a workbook you placed into your document library in SharePoint Online, and then went to your Power BI Site, and you will see the following image. If you hover over the workbook, you will get a tooltip letting you know that you haven’t enabled it yet. Enabling a workbook does a few things. First, it will load the Data Model from the workbook into the BI Backend for usage. Think of this as the same thing we do with Power Pivot on a SharePoint on-prem installation, where we will use an Analysis Services Instance in Power Pivot Mode to host the workbooks data model. Except, this is in the cloud. Enabling a workbook also will generate the thumbnail image that you see after it is enabled. After it is enabled you will see a thumbnail based on the Active Sheet of the workbook. That is the sheet that was showing when you last saved the workbook. If this is a normal Excel sheet, you will see a preview of the excel sheet. If it is a Power View report, you will see a thumbnail for the visualization. It is important to note that the Power View Thumbnail is based on the HTML5 (VRM) rendering of the report and not the Silverlight version. If you see an image of what that visualization would look like, but it appears greyed out, that would be a placeholder, but we don’t currently support that visualization. 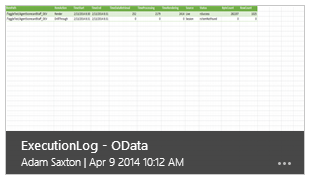 This image indicates that the workbook is enabled and properly published with regards to the Data Model. You’ll also notice there is no tooltip when you hover your mouse over the workbook. However, there was a problem when generating the thumbnail. This can happen for a few different reasons. First, there may have actually been an error when generating the image itself for the sheet that was active. 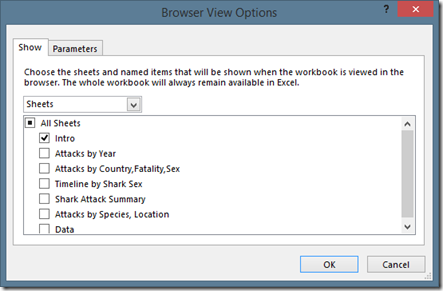 You may want to try changing the active sheet in the workbook, and re-upload the workbook. If you still see this image, it may be that they aren’t allowed from a workbook standpoint. This leads to another reason why the thumbnail may not be generated. 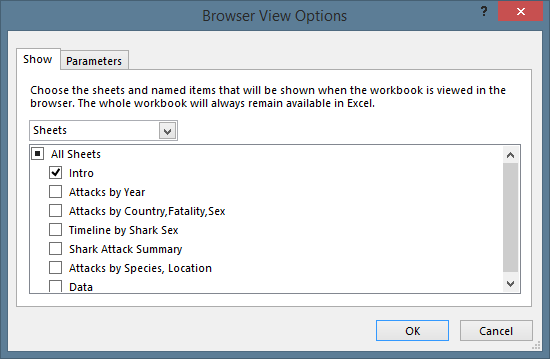 Within the Excel Client, you can restrict which sheets can be viewed online. When you open your workbook, go to File. At the bottom, you will see an Browser View Options section. 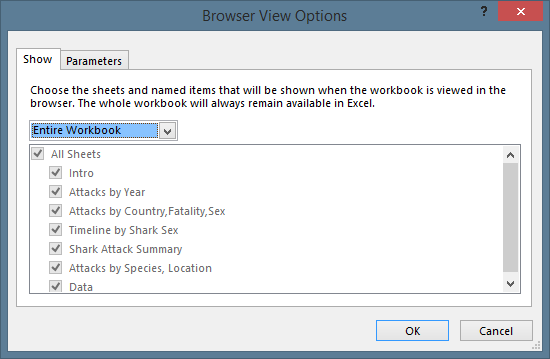 In the Sharks workbook, I have an example where only the Intro Tab will be allowed to be viewed online. 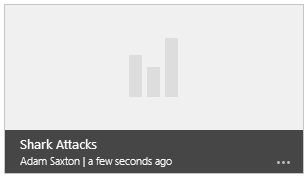 So, if the active sheet is any sheet other than Intro, you will get the image above with no thumbnail. 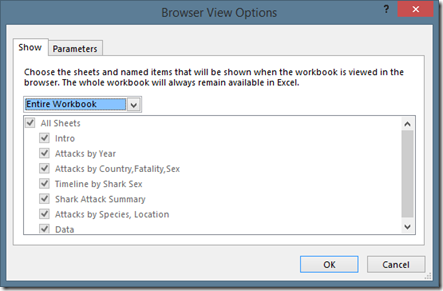 By default, Entire Workbook should be selected in the dropdown. Which means we will generate a thumbnail for any tab. While this doesn’t necessarily help you to understand why it failed, if it continues to happen, you can call Support to try and get more information. Make sure you keep the Transaction ID and Transaction Date information, as that is what we will use to go find the problem. If you are adding the workbook directly through Power BI Sites, and there was a problem, you will see the following thumbnail. 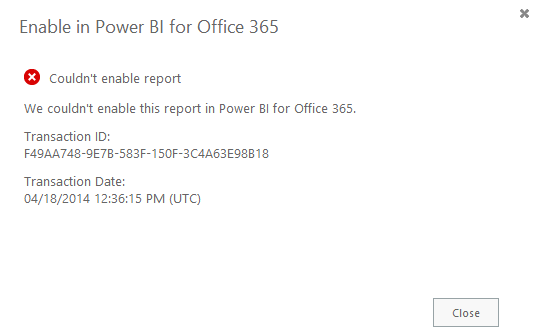 Something went wrong while enabling this report in Power BI for Office 365. Click the ellipsis (…) next to the report and then click Enable again. If you want to change what the thumbnail looks like, you will need to copy the workbook to a different location. Then open the workbook and change the active sheet. 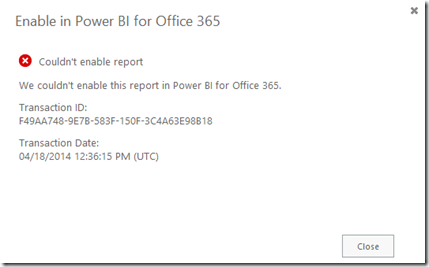 Once you save, re-upload the workbook to the Power BI Sites again. This also applies if you had an sheet that was disabled for Browser viewing and wanted to change the thumbnail to a different sheet that was enabled for Browser viewing.